Griffin Independent and White Box Theatre present UNHOLY GHOSTS by Campion Decent, at the SBW Stables, Theatre, Kings Cross. 27 August - 20 September. UNHOLY GHOSTS is a new Australian play from Campion Decent. It was the winner of the Rodney Seaborn Playwright's Award in 2012. The Son (James Lugton), waits on a red carpeted stage, seated before an old fashioned travelling trunk with some remnants of a past time still present, for the audience to arrive. 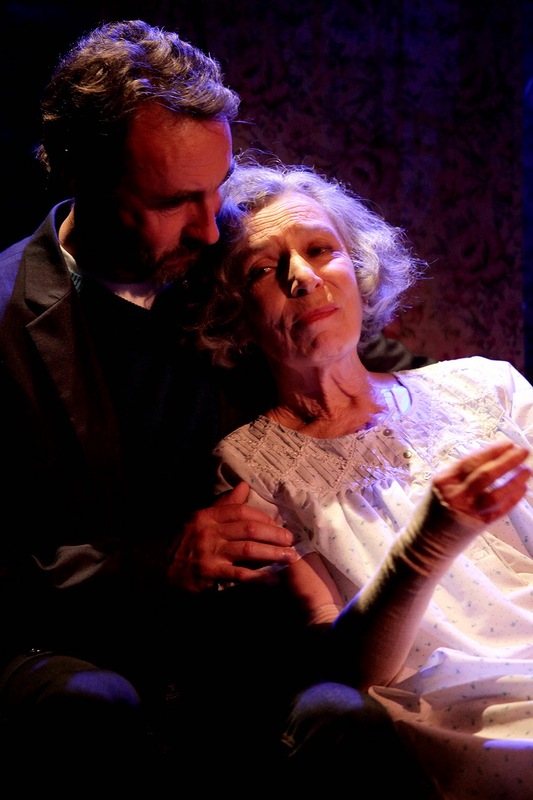 He then talks to us and conjures into life -, as does Tom Wingfield in Tennessee Williams', THE GLASS MENAGERIE - 'memories' of his family, his sister, his Mother (Anna Volska), and his Father (Robert Alexander). These 'memories' are nostalgic, humorous and sometimes rancorous, and, probably, filtered through a romantic poetic licence and the needful space of time. These parents, mismatched and hostile, though Roman Catholic have separated; a sister has died, tragically; and the Son carries a triple burden of being Catholic, Gay (with two kids - how modern), and a Writer - an artist! UNHOLY GHOSTS is a pleasant delight, and recalled, for me, other similar Australian works: A HARD GOD by Peter Kenna (1973); A HAPPY AND HOLY OCCASION by John O'Donoghue (1976), and A FATHER WE LOVED ON A BEACH BY THE SEA by Stephen Sewell (1978). Kim Hardwick (whose production of BANG***, was one of the best of that year, 2010, and whose work is not seen regularly enough) has created another fluid and sensitive production, supported by a Production Design by Martin Kinnane - particularly, the Lighting - and a Composition/Sound Design by Michael Huxley. Ms Hardwick's performers are insightful and delicate in their storytelling. It is a pleasure to watch Ms Volska, relishing the flamboyance of the theatrical strategies of her character - Ms Volska has been too long absent from the stage; Mr Alexander broaches an irascible and difficult man - as created by the Son - with wit, stringency and a steady and controlled 'good taste'; while Mr Lugton makes an impression of some attraction as the Son, that is some of the best work we have seen from him. The play could be edited further, and seemed to have more 'endings' than Melba farewells - the sentiment of the play, the journey, had been nicely etched well before the play finished, and the final, "We are family" tag, replete with disco music and bubbles 'forever blowing', was alarmingly unnecessary, and, distractingly, sat as a didacticism of a distinctly agit-prop nature. Bring out the blue pencil. UNHOLY GHOSTS, gentle and pleasing.